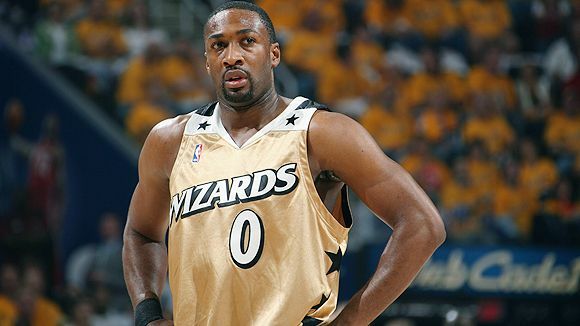 When the basketball pundits anticipated the Washington Wizards would have more firepower this season with the return of Gilbert Arenas, they certainly were not referring to the cache of firearms Agent Zero brought to the arena. Whether it is self-inflicted or not, the Washington Bullets…oops, I mean Wizards…have been a huge disappointment this season, and the team’s problems go beyond Arenas and his penchant for carrying weapons and storing them at the Verizon Center in case someone calls him out on a gambling debt. Washington is only 11-22 for the season and has dropped seven of its last 10 games. The latest loss was a 121-98 thrashing at the hands of the Cleveland Cavaliers on Jan. 6. Those are very dismal numbers for a team that was projected to be a playoff contender in the East, boasts three legitimate NBA All-Stars in Arenas, Caron Butler and Antawn Jamison, and owns a resume that includes four postseason appearances in the last five years and an offense – when all three stars are healthy – considered one of the best in the league. And, as if the team needed more bad news, Arenas was recently involved in a troubling gun incident with teammate Javaris Crittenton in which Arenas admitted to pulling out unloaded guns from a strong box stashed in his locker. Arenas – who has five years remaining on a $111 million contract he signed in 2008 – says it was all part of a “practical joke” and denied threatening or assaulting anyone. He reasoned that he brought four guns to the Verizon Center to keep in his locker in order to get them out of his house and away from his children. Well, NBA commissioner David Stern didn’t find the humor in Arenas’ so-called prank, as Stern suspended Arenas indefinitely without pay and the incident is still under investigation by the police. Even some of his peers are having a tough time defending Arenas. “Gilbert has been a little quirky at times on and off the court. This should get him straight,” former NBA player and current TV analyst Jalen Rose said on ESPN’s First Take. “If he doesn’t get a felony, he doesn’t get any jail time and he has a misdemeanor or anything less, if I’m David Stern I suspend him for the rest of the season. Washington’s implosion was definitely a mystery to many oddsmakers and handicappers, including Las Vegas Sports Consultants, which had the Wizards at 50-1 to win the NBA championship at the start of the season. Did the oddsmakers simply overrate them? “Absolutely we overrated them,” said Mike Seba, sports book manager with Las Vegas Sports Consultants, who dropped the Wizards down to 200-1 in his latest power rankings. “This is a classic case of the parts being greater than the whole,” said Seba, who added that the Wizards’ troubles started well before the Arenas-Crittenton situation. It’s quite obvious that the Wizards are not playing with the kind of free-flowing style that they enjoyed under former coach Eddie Jordan and, so far this season, the players have not bought into Flip Saunders’ more structured approach. “Flip has tried to come in and change things. With this kind of a team, they’re better off letting them play,” Seba explained. When Arenas, Jamison and Butler are in sync, which was in the 2006-07 season, the Wizards were fourth in the NBA in scoring (104.3). This season, they are in the middle of the pack at 17th (99.1). But whatever the team’s issues are, the firestorm starts and ends with the eccentric Arenas, the noted self-proclaimed goof ball whose been known to drift in and out of reality from time to time. When he was healthy, Arenas was a 28-point scorer and comparable to Kobe Bryant when in comes to late-game heroics. But after two injury-plagued seasons that limited him to just 15 games from 2007-09, Arenas’ scoring average has dipped to 22.7 and the multiple surgeries have robbed him of his explosiveness off the dribble. Now with this latest gun incident, Arenas may have robbed himself of his freedom. This article also appears on Covers.com.